Meatballs have been getting a lot of play lately. From the incessant features on the Meatball Shop in NYC, to the meatball entrepreneur Joey on America’s Next Great Restaurant and his “Saucy Balls,” it’s as if ballmania has struck and there isn’t an end in site. For me, though, meatballs have always played a part in my collective food memory. Although I never got to know my Sicilian side of the family in person, their customs and traditions were passed down to me through my grandmother and mother. Making a sauce, or gravy as it’s truly called, involved frying off scores of homemade meatballs, and I’d stand close by for the chance to snag a taste. Apparently the tradition of searing all of the meatballs but one, and then cooking the last one through to give to someone you love came from my grandmother long before I learned it from my mother. I like to think of my mom as a kid, indulging in the perfectly seasoned and seared meatball as the most loving of gifts in that it was rooted in tradition. No kids of my own, I have been known to carry on the tradition with my husband – he himself grew up in a part-Sicilian household as well, and where my fam was doling out tastes of meatballs, his was doing the same thing with his mother’s expertly cooked chicken cutlets. It’s only fitting that we’re together and I can carry on a legacy of culinary “sharing means caring” traditions. 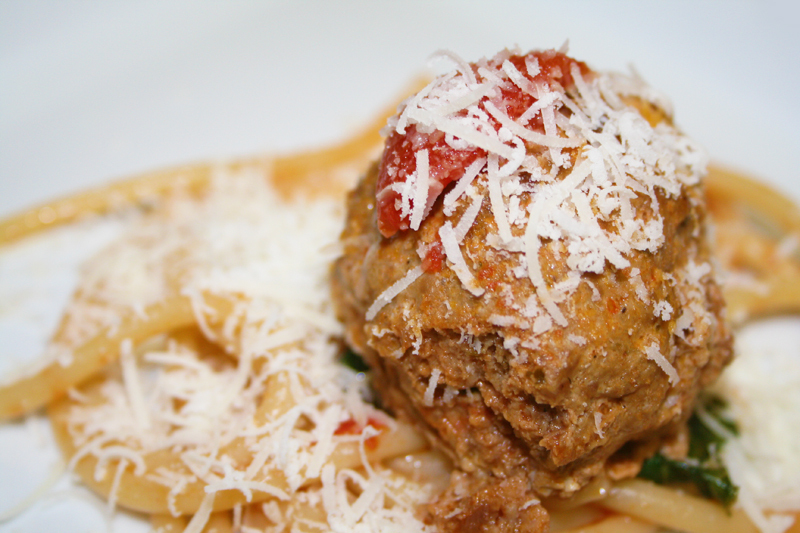 For those in the know, the secret to a good meatball is a good crust on the outside and a tender, juicy center. Although I’ll still sear off a meatball or two in a pan with olive oil, I’ve since converted to the baked meatball camp. You still get the lovely outer crust and it’s a whole hell of a lot less messy since you don’t have to tend to these over a greasy stove top. Because these babies were a part of my dinner party, the Feast of the Seven Boars, I used a combination of traditional ground beef and the less traditional but gloriously flavorful, wild boar. If you can’t get your hands on any boar, feel free to substitute ground pork or veal. Depending on how much time you have, you can simmer these the normal way on the stove in a lovely bath of San Marzano tomatoes OR you can take your sweet time and allow them to bubble away in a crock pot for a few hours OR you can be impatient and cook them in a pressure cooker for a mere 20 minutes. Any way you cook them, you’ll be treated to a perfectly tender treat meant to be served atop a delicious mess of pasta – maybe some bucatini with a heavy dose of crushed red pepper. Or you could just eat them straight away and skip the pasta. It is tradition, you know. Preheat oven to 450°. In a large bowl or a standing mixer, blend the meat, onion, garlic, parsley, eggs, crumbs, salt, pepper and oregano until thoroughly mixed. Wet hands and form 1/4 c. of the meat mixture into round balls. Place on a foil lined cookie sheet and bake in the oven for 20 minutes. In a large pot, add the tomatoes and crush gently with a spoon. Add the garlic, chicken stock and salt and stir. Add the meatballs and allow to simmer for at least 30 minutes – longer if you can stand it. When the meatballs are just about finished, cook the pasta according to the package directions. Toss with a cup or two of the meatball sauce, olive oil and butter. Toss the basil leaves in the hot pasta to wilt and top with some of the meatballs. Serve with grated cheese and extra crushed red pepper. June 9, 2010 Angela G.
If good Sicilians love the joys of a meatball, then it’s no surprise that good cooking Sicilians know how to whip one up with class. Consider me a fan, nay a fanatic, of the meatball. So much so that I love them in all shapes and forms, from the Vietnamese variety as delicious Bo Vien in a steaming bowl of pho, to this recipe for piquant albondigas, Spanish meatballs flavored with paprika and cooked in a red pepper and sherry sauce. For you red sauce fanatics out there, this one is a lovely change of pace. Albondigas are often found as part of tapas, a collection of small plates of both hot and cold nibbles hailing from Spain. These are served in sauce in a small clay dish with nary a bit of pasta or rice as accompaniment. As such, you’ll probably want to get a good-quality, crusty loaf of bread to use to sop up this absolutely delicious sauce. Throw in a dish of garlicky olives, manchego cheese, marinated mushrooms, and manchego cheese for a simple Spanish spread. Or make a few other cooked tapas, like a Tortilla Española (a simple Egg and Potato omlette) or Pollo al Ajillo (chicken sauteed with garlic and sherry), and feast like a champion matador minus the unnecessary bull-slaying. Olé! The real trick to these guys, as with most meatballs, is to sear them very well before plunking them into your sauce of choice for slow-cooking. Doing this allows the meatballs to keep their shape, seal in the juices, and allow them to become meltingly tender after cooking. You want them dark brown before adding to the sauce to keep things awesome. And for you, I want nothing less than awesome. Add pork, beef, garlic, parsley, oregano, pepper, salt, onion and worchestershire sauce to a large bowl and mix well. Mix in egg and bread crumbs and set aside. Wash hands well and then wet them thoroughly. Scoop out about 2-3 heaping tablespoons into your hand and roll into a ball. Place on a plate and continue to roll meatballs. To a food processor or blender, add the piquillo peppers, the tomatoes with juice,two tbs. of olive oil and the sherry. Pulse until smooth. Taste for salt and pepper and season accordingly. Pour mixture into a dutch oven and put over medium-low heat to simmer. Heat the remaining 2 tbs. of olive oil in a skillet. In batches, brown the meatballs on all sides, making sure to sear them well. As they finish, add them to the piquillo pepper sauce. When all meatballs are browned an the skillet is still hot, carefully add the white wine to the pan. As the wine reduces, scrape up the browned bits on the bottom of the pan. Add the chicken broth and continue to reduce by half. Pour liquid into the pot with the piquillo sauce and meatballs. Cover dutch oven and place into the oven. Bake for 40 minutes, checking after a half an hour to make sure that the sauce hasn’t thickened too much. If it looks as if there is no liquid left, add a 1/2 c. of water, recover and cook for the last 15 minutes. To serve, remove albondigas to a dish and top with the piquillo pepper sauce. Sprinkle with chopped parsley and serve.